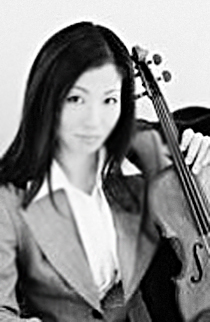 Akiko Tanaka, violin, was born in Osaka, Japan and studied with Akiko Tasumi, Yfrah Neaman, Wanda Wilkomirska, and Herman Krebbers in Tokyo, London, Mannheim and Amsterdam. By the age of 11 Akiko had already won the Japanese Music Competition. Later she became prize winner at such prestigious international competitions like the First International Violin Competition Hannover («dedicated to Joseph Joachim»), the International Vichy Competition in France (1st Prize) as well as 2nd prizes at the Jean Sibelius Competition in France and the Wieniawski Competition in Poland. In 1998 she became at laureate at the prestigious ARD Music Competition. Since her debut at London’s Queen Elizabeth Hall Akiko has appeared as soloist in recitals and orchestral concerts in over 30 countries. She has performed with leading orchestras and artists, like the Japan Philhamonic Orchestra, Cappella Istropolitana, Finnish Radio Orchestra, Helsinki Philharmonic Orchestra, Century Orchestra Osaka, Tapiola Sinfonietta, Osaka Symphony Orchestra, Sapporo Symphony Orchestra, Polish Radio Orchestra Warsaw, NDR-Orchestra, Hamburg Symphony Orchestra and the Stuttgart Chamber Orchestra, Jukka Pekka Saraste, Sergu Comissiona, Norichika Iimori, Ken Takaseki and Pascal Roge. Akiko has recorded for broadcast and CDs. In 2000 the composer Wilfried Hiller dedicated his piece for violin and piano “Der Tod ist eine schöne Frau” to her.